UniqArts offers unique and creative team building through recycling for Corporate event, retreat, responsible global organization and citizens, creative problem solving, sustainability, and wellness. 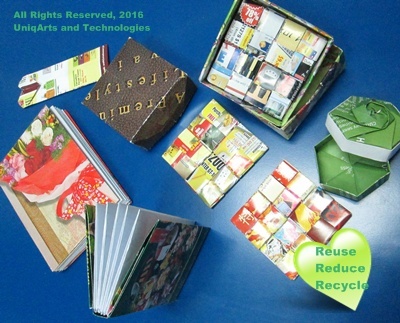 By using old, discarded or recycled materials (papers, plastic, wood, etc. ), we incorporate green approach, reusable new idea and innovative way for team bonding and teamwork out of the usual work routine. We try to engage all participants to play a part in the entire team building through recycling program. Be part of responsible global citizens and companies. Get your team ready work together to be creative into practice for saving the earth. Get them out of the work routine and engage them thinking about sustainability, clean, green and for the future. To promote sustainability, recycling, reduce and reuse concept as responsible citizen and entity of the earth. To engage our creative mind and learn how to be resourceful. To develop team building through use of recycling papers or materials. To provide environmental friendly for creative teamworks. To provide team bonding through transformation of recycled materials (papers, plastic, wood, etc.) into functional and decorative objects or products. To stimulate, enhance and unleash creative thinking as a team. To increase team problem solving skills. To strengthen team spirit by working through out of works team activities. To enhance team identity and cohesiveness through team bonding. Our Team Building program through recycling is designed in stages for positive experiences in team bonding. Our qualified and experienced trainer will guide the entire process to allows members to learn the basic usage of art materials and application. They will be able to proceed to next level by understanding each other strength through creative works. Members tasks are to be assigned creatively and productively. Once they are ready, members to start to do creative art together. Team members are gain insights about their own individual creative talents, strength and how their contribution to the team. We provide debrief of the team building and bonding process for members to reflect, review and learn from the event. Members to get feedback from each other and explore how this process could be useful to their work place, team and personal life.To provide exceptional and inspirational experience, we incorporate creativity and art jamming and art therapy into the process. The process can strengthen a team and create new bonding. Some of the products created by the team members can be very useful in the office or at home. Some can be given as a gift. Participants will be amazed the transformation of old and discarded items such as magazines and papers and make them into daily useful items. These items may include Coasters set for Coffee and Tea, Hard cover Notebooks for writing notes, Bookmark and gift for kids. They can be decorative items such as Flowers in a Vase. There is no limit for this creative useful products through art of recycling. Some of these products can be built entirely without any glue or cutter, and some can be designed through the help of tools. Participants will get to bring home of their teamwork products, sharing and personal contribution. We incorporate the art of folding for using papers to make them to simple to complex Products with or without use of cutter or glue. 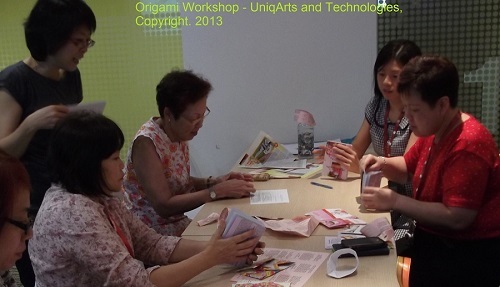 Participants with some experiences in Origami (paper folding) will be able to build more products at ease and with confidence. Children can be involved for paper folding. Our team building trainer Mr. Paul Lee is qualified, experienced and trained in the art and creativity fields. Mr. Lee is an artist, art therapist, consultant and founder of UniqArts and Technologies. Mr. Lee holds a Master in Arts (Art Therapy) with LaSalle College of the Arts and A Bachelor degree with Royal Melbourne Institute of Technologies (RMIT). He is also trained in fine arts from Nanyang Academy of Fine Arts (NAFA). Mr. Lee has facilitated many creative art projects for therapeutic and developmental. Mr. Lee is the author of the popular Drawing is Easy books series and creator of several innovative program such as Creativity-Juice, ChinesExplorer, Animation is Easy, Creative Art Therapies, OnlineArtclass, and many others. "Wonderful. It is very useful, especially making the Notebook. (Zarina)"
"Able to make useful products out of recycled materials. (Veronica)"
"Excited, it is something new and different. 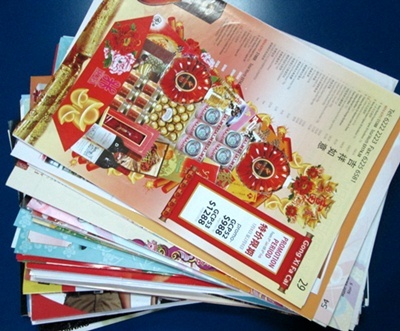 Good to recycled some of our used papers. (Suryana)"
"Team bonding, excellent teamwork. Using recycled materials to make them alive! Enjoyed myself very much. (Eunice)"
"I like the program as it teaches us patience and teamwork. Good to learn, can teach my kids next time. (Thomas)"
"Good fun. Learned to make coasters and books. Can make present in future. (Julie)." "I have learnt very interesting handicraft. Good way to bond with family and friends. (Mr. Wong)"
"Good, very therapeutic. Very fun. (Badariah)"
"New discovery. Interactive and enable team bonding. (Glen)"
"Bonding over crafts using recycled papers. Bonding and more bonding. (Sanis)"
"Excited, felt that back to School. Great teamworks. Do not throw magazine papers. (Juwita)"
"Fun, excited, enjoyable, good bonding. Appreciate papers now. (Mazita)"
"Initial disinterest, enjoyment and proud of achievement. Nice recycling of materials without any glues and staple! (Kelvin)"